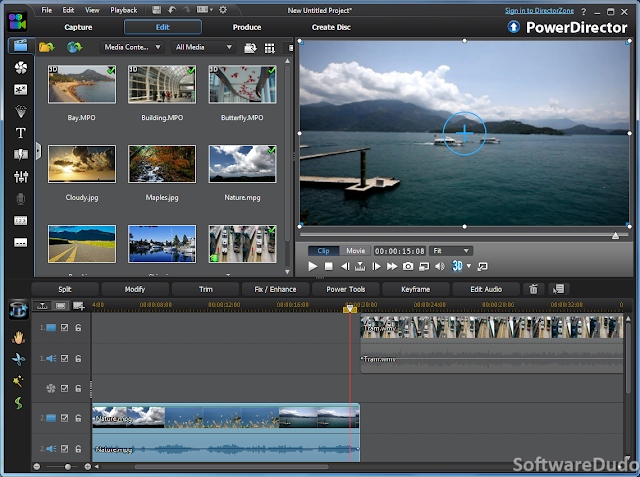 PowerDirector 12 is one of the best premium video editing software developed by Cyberlink Corporation which allows you to capture, edit, and produce professional videos with powerful video editing tools. It has provided several tools to improve and edit projects quickly. The Magic tool like ‘Magic Movie Wizard’ helps you to edit movie with transitions and effects. The Multicam editing with up to 4 angles is great, while you can edit 3D and 4K resolution videos easily and produce great videos. You can directly upload the edited videos to popular video sharing sites and even transfer directly to mobile devices. It has huge online community resources for support. Cyberlink PowerDirector 12 is the easiest and quickest way to create and share your home videos with the help of "Theme Designer”. You can simply choose the set of built-in stylish 3D-animated templates, import your media files into one of the templates, and instantly turn them into professional videos. PowerDirector 12 includes over 100 media editing tools and more than 400 built-in effects, which will aid you to create amazing videos. The processing and rendering speed is faster compared to the previous versions. With the help of TrueVelocity 4 Engine, the H.264 encoding is 40% faster and the Intel 4th Generation CoreTM Technology allows users to experience 3 times faster rendering with AVX2 technology. There are five different versions in PowerDirector 12 – Deluxe, Ultra, Ultimate, Ultimate Suite, and the complete Director Suite 2. If you want to have complete video and photo editing tools for creative professionals, get Director Suite. The MultiCam Editing feature is not available in the Deluxe version. What’s New in PowerDirector 12? H.264 encoding gets 40% faster with the help of 64-bit video editing. Theme Designer – Converts your videos and photos into a stylish 3D-animated slideshow videos. Enhanced Chroma Key, allows you to create special effects by taking videos in front of a green or blue sheet and merging with other videos. Subtitle Room - Customizes your subtitles by setting font, color and position. Auto Crossfade – Applies smooth transitions between clips like inserting crossfade transition between 2 clips on timeline tracks. Dolby Digital Plus – Importing and Editing 5.1 channel Dolby Digital Plus surround sound. Importing PowerPoint files right to PowerDirector. Design Studio Tools, brings stylish design to your video creation and gives you more control over video effects. ‘PiP Designer’, intends its animation with the convenient timeline interface. ‘Title Designer’, customizes title designs with different font types, color gradients and animated effects. With ‘Particle Designer’, you can design your own particle effects using your own graphic objects and the built-in animated effects. Finally, with ‘Menu Designer’, you can personalize menus with titles, chapters, particles, and PiP objects to suite your own unique style. TrueTheater Enhancement Technology – TrueTheater HD, TrueTheater Stabilizer, TrueTheater Lighting, and TrueTheater De-noise. The interface is so easy to learn and intuitive. 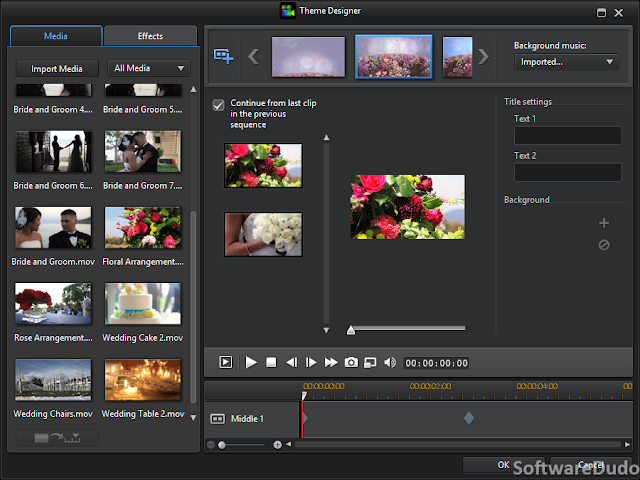 The new editing mode selection interface gives you great control over video editing which includes 100-track video interface, MagicMovie for instant video creation, and stylish photo slideshow creation. You can produce DVD discs with stylish menu, transfer them to all multimedia devices, or share directly to social site such like Facebook, YouTube, DailyMotion, Vimeo and NicoNico Douga. You could browse thousands of free effects and templates, watch free tutorials on DirectorZone, the largest video editing online community. Cyberlink PowerDirector 12 Deluxe is supported in Windows 8, 7, Vista and XP systems, with minimum 1024x768 resolution, 2GB RAM, 5GB Hard disk space, and 128MB VGA VRAM or higher graphics card. For Full-HD quality H.264 and MPEG2 profiles, you need Intel Core i5/7 or AMD Phenom II X4 CPU processor.